It’s very easy for the world to see the MOS6581 SID chip as a toy. After all, it was in Dixons, wasn’t it? However, slowly but surely the SID has been working its way into the mainstream of modern music: well, into the club/dance scene anyway. The creation of the SIDstation (and later the Hardsid and Quadrasid) allowed musicians with misspent youths to twiddle away and recreate the unique sounds that they were always frustratingly unable to reproduce on other, supposedly more powerful, analog equipment. The list of SID inspired artists is a lot longer than it used to be: Welle Erdball, Zombie Nation, Mikron 64, Enduro, Bastian, APG, Machinae Supremacy, O:PL Bastards, Ron&his1541, Jeans Team, Big Chief Electric, 8-bit Crunch, 8-bit Weapon and more. The results are of varying satisfaction to dedicated fans of SID, but the fact remains that the list grows, and you’re a lot more likely to hear extra SID in the charts than you were. Well, we could be about to see an increase of SID in the charts. Why? The biggest sample CD producers in the world have produced a two-CD set of... SID samples. Now I have to admit something here: in a lot of cases, I’m more of a fan of the music on the C64 than the actual sounds. As a musician, it was always the power of the ideas expressed by the classic composers that turned me on as opposed to how they were expressed. It’s a testament to the power of the SID chip however, that many musical ideas expressed through SID could not be separated from the way they were expressed: a particular wibble in the note, a particular pitch bend: all of these things were important in the whole “loving SID” experience. So my feeling is that concentrating solely on the sound of the SID misses the point a little. But then, my perspective is a unique one: most people would just be glad to hear SID in commercially available records, and leave it at that! 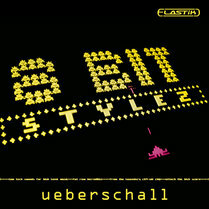 “8 bit stylez” is such a tool, and it could only have come from Germany. I say that because Germany has been the powerhouse behind the use of SID in commercial and underground recordings. Sometimes uncredited (stand up Clatterbox and Zombie Nation) there is clearly a spiritual link between lo-fi synth and the Germany musical psyche. Here we have a 2 CD set full of original but representative bits of SID sound madness. The first CD is an Audio CD: after a demosong in two parts, the first few tracks contain SID grooves such as “Keep Cool”, “Toga” (which features genuine 8-bit speech saying “Toga”), both in mix form, and in a construction kit form with each of the sounds in the kit recorded one after the other. Each of these grooves manages to be diverse and original, though you can see the individual styles of certain composers peeking through in the choice of instruments (Matt Gray, Jeroen Tel and Tim Follin seem to be particularly hinted at!). There is an admirable amount of originality here, and it’s obvious that the producers of the CD are hardened fans of the chip, and experts at programming it. Some of the demos and grooves are very hard edged though, to the point of being unpleasant to listen to. They sound like SIDs did 15 years ago before the great musicians hit. It’s as if the person who was given the job of creating actual musical ideas had never heard Commodore 64 music before in the form we know and love. The most popular C64 tunes were always those which managed to turn blippy bloppy sounds into epics. Here the CD panders to the computer music stereotypes prevalent in the general population. Of course, this is a great way to sell to the general population, so to that extent they’ve pitched the product perfectly: to jaded musicians in search of an unusual sound. After all, most of the hardened SID musos already have a Hardsid, a Sidstation, or something else that produces SID sounds for them. This is really a cheap alternative to SIDstation, though you do not get the melodic lead sounds you can get from that machine. But that’s kind of harsh, because as I said, the actual sounds are top notch, and fully usable. If you’re buying a CD for sonic rather than musical ideas, then you won’t be disappointed. The sonics are great: sounds which might sound weedy through your TV but here sound meaty and powerful. After the groove/kits come the drumloops. You don’t get “kits” with these, just the loops (something rectified on the second included Akai-format CD. These range from “are they doing this with a SID?” through to “wow, I could build a track round this” to “what the f***?”. I’m sure everyone who buys this will classify each loop differently! There’s certainly no shortage of ideas. At this point I must mention the packaging and presentation of the CDs, which is (as you’d expect from a company this experienced at producing sample CDs) top notch. Everything is fully labelled, with BPMs as appropriate, across the 2 CDs. The descriptions of the sounds vary in their descriptive power, but with sounds this abstract I couldn’t do better. If you trust the description you’ve got a fairly good chance of guessing the emotional mood. Right, back to the CD. After the drumloops come the “Background Tracks”. From beepy to noise, these would be quite difficult to use in a mix: you would either have to put them in a break where it didn’t have to compete with other musical ideas, or build an entire mix around it. I would say these are the least useful tracks on the CD: HVSC is replete with (albeit copyrighted) melodic ideas which are better. The same is true for the “licks and loops”. It’s hard to see how you’d put these in context without them taking over your track. There is a good spread of FX on the CD, which would be very usable indeed: FX is one area in which the C64 did indeed sound like its stereotype: game FX sounded like game FX. How many you would want to cram into a particular track is debatable, but most types of sounds are represented. However, ironically the licencing rules behind this CD forbid you from using these sounds for game purposes! To round off CD 1, you have some 4-bit sampled speech (counting to ten, with some additional phrases) and some synthesised SAM-type speech (again, counting to ten with additional phrases such as “Runtime Error”. Very useful stuff to convey that 8-bit feel. For hardened musos the real meal of this set is on CD 2, which contains Akai format sample sets. This is a special format which allows samplers to load sounds in preprepared banks: which saves an awful lot of work. To their credit, the producers have produced a complete set of new sounds on disk 2 for the buyer (most sets would duplicate the sounds on both CDs). These sounds are very effective and well- organised into sets like “Bassdrums”, “Hihats”, “Snaredrums”, “Cymbals”, “tomtoms”, “Percussion”, Electro drums”, “4-bit sounds”, “Sound FX”, and many single sounds. Plus there’s more speech, licks and loops and sound FX only available to sampler users. SID chip, variations were created during the sound reproduction. With the samples included here, this live quality can be recreated in the sampler”. And if that’s not attention to detail, what is? So, that’s the CD. Akai + Audio CD for £59.95. Is it worth it? Yes, if you’re used to sample CDs costing this much! If you were putting together a collection of all the unique sounds in HVSC, it would come pretty close to this collection. Since these have been recorded from a real SID chip (though with some occasional worrying crackling which is probably intentional), Sidphiles will be immediately pleased with what’s on offer. The drum patterns are inspiring in places, and the sound FX are as you’d expect. The CD is extremely well organised, which allows the user to get the most out of the sounds, and the punchiness of the sounds is excellent.